Firstly, Rick Perry's situation is not analogous to Galileo's. Galileo stuck to the data, upsetting the religious establishment which ultimately persecuted him. Rick Perry is with the gang of thugs that is suppressing the data. Read the statement by Texas scientists who stick to the data. The "diversity bake sale" price list also has it backwards. The campus republicans charged $2 to whites and $1.50 to Asians. If they stuck to the admissions data before passage of proposition 209, they should have charged Asians more than whites. The problem had become so severe, that the gap in SAT between admitted Asian and white students was larger than that between whites and blacks. That's ancient history in internet time and the only current link I could find is this lame NYT article. In the late 1980s, administrators appeared to be limiting Asian-American admissions, prompting a federal investigation. The result was an apology by the chancellor at the time, and a vow that there would be no cap on Asian enrollment. Note also that the campus republicans charged men more than women. In actuality, colleges are admitting less qualified men over women in the name of "gender balance" due to the higher numbers and qualifications of women applying to college. Why do white males have such a persecution complex despite contrary evidence? Before Prop 209, it was a tough time for white students in the sciences at Cal for the same reason Ward Connerly cited for the harmful effect of affirmative action on black students. Professors assumed that white students got in on affirmative action and devoted their time and attention to the Asian students who got in on merit. One highly qualified white classmate complained that teachers ignored him at office hours, assuming that he had only stupid questions. They would much rather take questions from Asian students, who were perceived as smarter and had higher order questions. I watched class dynamics after that and he had a good point. Bad Dad, a white male (also a Berkeley alum), states that he doesn't feel persecuted--quite the opposite. "How can we be discriminated against when we run everything?" But I still notice that he "drives while white". A black, latino or Asian driver could never roll through stop signs in a "California stop" in front of the police and get away with it. He insists it is fine and I have seen many a person of color stopped for driving violations that he makes every day. ... is now a guest blogger. I'm Iris, and you should have already known that. Just wanted to say hi. Well, bye! I am not sure if this is a violation of the rules. But Iris and I signed up to take an online AI (Artificial Intelligence) class together, but using my email account only. We are going to listen to the lectures and discuss the problem sets together. I will be responsible for writing up and emailing our homework sets. I don't know in advance whether she has a long enough attention span for this. Or whether either of us really have the time to do this in between her school and my work commitments. We signed up for the advanced class, which requires us to do all the homework and take all the exams. If we fall behind in our homework, we can always change to the basic (audit) version of the class. We are really excited about this. I have had a long-time interest in Markov models. Are there any other people doing this with their kids? Is this considered cheating or collaborative learning? After all, she's 10 years old--too young to sign up on her own. This is top #11 for 2011 that I've sewn, but I haven't had much time to post about my sewing progress this year. It's Simplicity 2192 with modifications. I have a fantastic blue and white hat that I wanted to wear for photographing this shirt, but Iris packed that hat for her weekend in NorCal with my sister. I had to commandeer her pink hat instead. Nevertheless, the blue coffee mug matches the shirt. It's filled with Peet's coffee, very apropos for a couple of Berkeley alums on a child-free weekend beach stroll. I was inspired to post about this particular top because Lindsay T posted her version of Simplicity 2192. She had written earlier that she grew up in Palos Verdes, the hill in the background behind me in the above photo. I used mid-weight stretch cotton twill that I bought by the pound (~$3/lb, or ~$3 worth of fabric) from SAS Fabrics in Hawthorne. It is perfect for this design, except that the directional print required me to cut the top on the cross-wise grain and the stretch direction runs up and down the top. Like Lindsay, I found the top extremely roomy. But, we have radically different builds and employed different fitting solutions. The design looks purposely drop-shouldered, but was overly so on my average frame. On the paper pattern, I made 2/3" tucks at the center front/back and midway between the shoulder and the neck but left the sides and hips alone. That took out 2.0" of width across the shoulder area and it sits nicely on my shoulders. It has just the kind of slouchy casual vibe I was after. My only problem now is that the high neckline feels like it is strangling me. I may remove the topstitching and bring the front neckline down by 1/2". 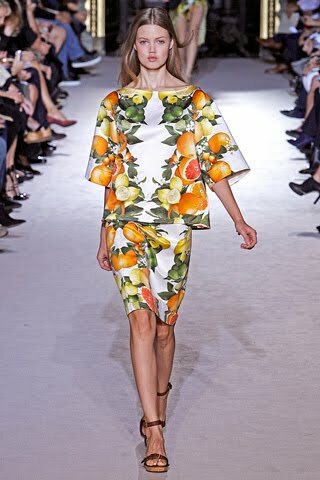 I was inspired by the casual insouciance of the Stella McCartney citrus print from her Spring 2011 RTW line. (Photos courtesy of Style.com.) The SM top is ubiquitous in LA this Summer. I read an interview with DVN in which he said that he pulled out some of his past season fabrics and noticed how well they looked, mixed with one another. So he made a few samples and everyone who saw them loved them. 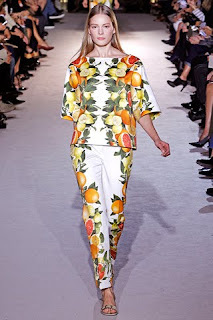 And that's how he developed his first collection of mixed fabrics. I like that story because it's a recycling/reuse story. These are tough economic times and he uses very costly fabrics. I am glad that he's able to put his old leftover bolts to creative new uses. My fabrics are much more prosaic washable cotton/rayon/lycra blends for the most part. The purple/green paisley looks like it might have some acetate blended in there, too. Most of the stuff that I sew and wear for my everyday life are mystery pieces purchased by the pound at SAS Fabrics. They sell leftovers from the LA garment trade. Some of them are bolt ends, others are sample cuts. Some are damaged sections and I have to cut carefully around the defects. I like the idea that factory waste can be reused by home sewers like myself instead of being sent to a landfill. It takes a bit more time to cut around the fabric flaws, but I do it because I am a dyed in the wool recycler. Moreover, the fabrics that I can purchase from SAS are not usually available to home sewers. Now that Florence Fabrics, TreadleArt and the Cotton Shop have closed, there are no apparel fabric stores in the South Bay region of LA. I have purchased apparel fabric from Joann, but they have all been disappointing after washing. In fact, I returned three cottons that I purchased this year because they were unbearably scratchy after the fabric finishes were washed off. I've been tracking my sewing projects for the past couple of years and noticed that my favorite clothes have all been sewn with fabric from SAS or independent stores like the defunct Cotton Shop. After the top photo was taken, we walked back up the hill along a "walk street". These homes have alley access in the rear. The times are a changing. The one-story beach cottages are being torn down and replaced with 3-story ones that take up the entire footprint on the small lots. I, too, live on a redeveloped lot. At one time, our lot held one < 1000 sf one-story shack, which was torn down and replaced with two two-story townhouses.